Fi360 Pacific have tailored a programme for Philanthropy New Zealand, which covers the components of a defined fiduciary investment governance framework. Learn the higher standard of investment process being adopted globally by boards, investment committees, trustees and investment service providers. Raise your awareness and capacity in your fiduciary role and add genuine value to your investment governance decisions. Increase the confidence in your stewardship with donors, beneficiaries and regulators. Read more about Investment Governance here. 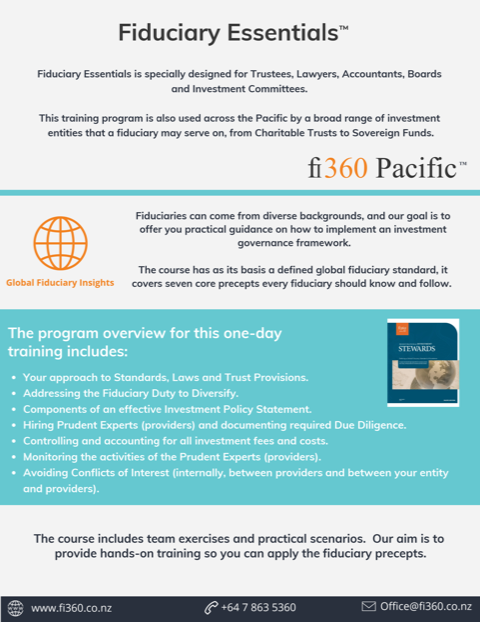 Learn about the "Fiduciary Essentials" training programme here.